Store your precious coins here! Come here to link moves together and use two moves in one turn! Or come here to remember a move! Come here for Chansey to care for your precious eggs that you get from jobs! Come here to test your skills and train up! Come here to buy items for your adventures! Come here to store your treasure! These rooms are for Exploration Teams only! Little Wilderness has 5 tiles each floor and 3 floors! The pokemon found here are Pidgey, Ratatta, Spearow, Sentret and Zigzagoon. A dungeon very hard for fire-types. Here you can find Shellder, Horsea, Poliwag, and Finneon. This dungeon has 5 tiles each floor and 5 floors. 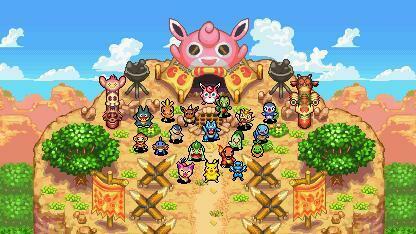 A plateau full of electric-types. This dungeon has 5 tiles each floor and 5 floors.You can usually find Plusle, Minun, Voltorb, Pichu, and Elekid. This dungeon is full of flying type pokemon. You can mostly find Fearow, Pidgeot, Dragonite, and Staraptor. This dungeon is for pretty advanced teams. Each floor has 7 tiles. There are 10 floors. Talk about anything! Share your artwork! Share your sites! Anything! We would love to hear your questions, too!